They were very caring and understanding. Showed me what was going on underneath the car and said it was to dangerous to drive. Thank you Handa for having such a caring crew. 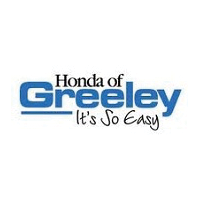 I purchased my 2019 Honda CR-V from Honda of Greeley everything was easy and they helped me understand the process for my trade. My salesperson, Taylor, was very friendly and patient when it came to reviewing paperwork in the children's area where my 3 year old was set on staying. Financing with Jeffrey, didn't take long at all and it was all such an easy process and the plus part was I walked out with my car that day. I highly recommend this dealership. You wont regret it!